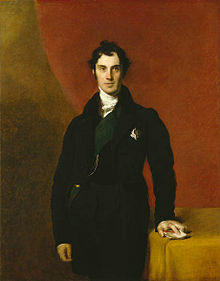 George Hamilton-Gordon, 4t EYerl o Aiberdeen, KG, KT, FRSE, FRS, PC, FSA Scot (28 Januar 1784 – 14 December 1860), styled Laird Haddo frae 1791 tae 1801, wis a Breetish politeecian, diplomat an laundainer, successively a Tory, Conservative an Peelite, wha served as Prime Meenister frae 1852 till 1855 in a coaleetion atween the Whigs an Peelites, wi Radical an Erse support. ↑ 1.0 1.1 1.2 Hoiberg, Dale H., ed. (2010). "Aberdeen, George Hamilton-Gordon, 4th Earl of,". Encyclopedia Britannica. I: A-ak Bayes (15th ed.). Chicago, IL: Encyclopedia Britannica Inc. p. 28. ISBN 978-1-59339-837-8. This page wis last eeditit on 14 Januar 2018, at 03:15.